The Penrose Lounge at Four Seasons Hotel DIFC. The Four Seasons Hotels and Resorts chain has been setting the benchmark in luxury hospitality over the past 50 years and its second property in Dubai, UAE, is no exception. 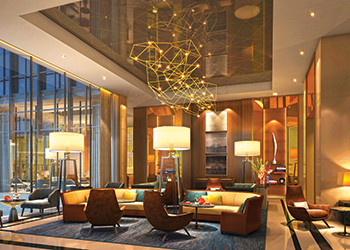 Located in Dubai International Financial Centre (DIFC), the ultra-luxurious 106-room hotel, which opened its doors in March, offers an intimately sized yet contemporary urban oasis for business travellers. 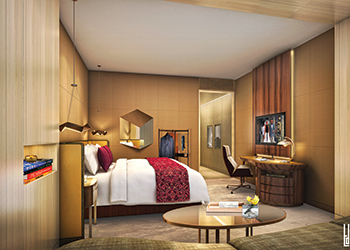 Blending a modern boutique aesthetic with the refined Four Seasons essence, the hotel’s chic interiors have been designed by the internationally renowned designer Adam D Tihany. Blending seamlessly with the surrounding DIFC, the hotel has two entrances, one at the ground level and another from the upper level retail concourse. Its 106 rooms are characterised by impeccable craftsmanship, bespoke finishes, and attention to detail. The hotel’s identity demonstrates an elegant and refined environment. The Four Seasons Hotel DIFC’s design is both streamlined and sophisticated, providing an intimately scaled destination in the heart of the DIFC. Adam’s design focuses on efficiency and functionality, as each space fluidly flows into the next. Commenting on the unique style of the hotel, Adam says: “Four Seasons Hotel DIFC is nothing short of a custom-tailored suit, elegant and designed to completely adhere to the needs of its clientele. There is a hand-crafted quality to the hotel. As the building has several floor plates, the designer had to first establish whether it was feasible to use it as a hotel premises. “Once that was established, the next step was to find out the quality of the hotel the operator was looking at – a five star or a six star as that dictates the design a lot,” Adam points out. For art elements, Four Seasons commissioned Adam’s son Bram Tihany, an award-winning New York artist, to create 19 pieces of original art, which can be found throughout the new property. His series of work, entitled Morphe, pays homage to the iconic Dubai skyline and has been created by masterly dissecting and recomposing a collection of architectural photographs that he shot in Dubai. The series of bespoke photographic murals serve as a window into the overall philosophy behind the hotel’s design. Distinguished by its intimate scale and effortless sense of inclusivity, the hotel’s interiors speak volumes of the city’s recent self-reflection. The Luna Sky Bar ... strong black and gold colours dominate the space. While designing the entrance area, Adam kept in mind accessibility and comfort for business travellers. The ground-level reception is framed by gold metal mesh and accented by cream and black marble and bronze mirrors. A second lobby at the podium level allows for pedestrian access from the retail concourse. A key focal point in the lobby is a bespoke architectural mural by Bram. The adjacent Penrose Lounge features a custom geometric chandelier and gold mirror faceted bookshelves and a stylish bar front. Meanwhile, the hotel’s Firebird Diner by Michael Mina reimagines the glamour of the 1950s in a contemporary diner. Three sides of the venue have floor-to-ceiling windows, opening up to expansive views of the city, while three stylised art pieces, also designed by Bram, display retro Cadillac-inspired sculptures along the back wall. 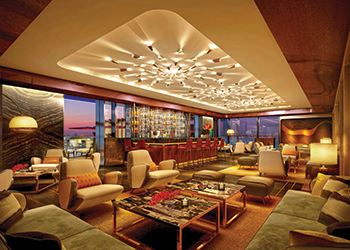 Luna Sky Bar on the eighth floor evokes the symbolism of the falcon, the UAE’s national emblem of bravery. Strong black and gold colours dominate the space, while the ceiling light fixtures and bar back mimic birdlike features. From Luna, guests can retreat to the secluded Churchill Club by ascending a showpiece staircase, where curved wall fins and rich wood millwork create a masculine yet classic space. The hotel’s rooms and suites are designed to cater to the needs of today’s traveller without compromising on style, as furnishings and fittings employ curved edges to create a smooth and welcoming environment. Premier, deluxe and superior rooms feature stunning wood-clad walls; hand-tufted custom carpeting and faceted metal pendants. 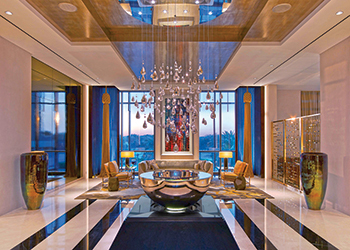 In the suites, a custom metal mashrabiya frames the windows, which overlook stunning views of the Burj Khalifa. An inside view of the hotel. The spa features five treatment rooms as well as changing areas that cater to early arrival and departure and were designed as a haven of relaxation. On the rooftop pool terrace, an equally relaxing cabana-lined deck is home to a unique above-ground glass pool reminiscent of a tranquil aquarium that transforms at night to resemble a glowing blue jewel. “Hospitality is not something you learn, it is an instinct. It is important to be attuned to people’s needs, being concerned about their comfort and well-being. I design things that make people’s lives better and help them feel comfortable and happy,” says Adam. His sense of luxury and hospitality comes from his own experiences as a customer. “I try to enhance the experience as much as I can,” he says. The hotel is far from the glittering palatial meeting places of the past, as its design whispers to the discerning ear of those who listen, he adds. The mood is sophisticated and adult, drawing clientele from a new, self-assured generation of Dubai. Tihany Design is a multidisciplinary design atelier with offices in New York and Rome that concentrates on luxury hospitality design. Founded in 1978 by Adam, the firm dedicates itself to custom tailoring restaurants and hotels to reflect each client’s singular vision and unique brand of hospitality. Known for successfully integrating bold, contemporary designs in landmark spaces, Tihany Design’s aesthetic is an unexpected integration of contrasting elements that together create perfect harmony.